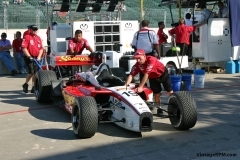 Open-wheeled racing returned to Houston in 2006 after a five year hiatus. Instead of running around the downtown streets as they did in the days of CART, Champ Car would now run through the streets and parking lots of Reliant Stadium and the Astrodome, south of downtown. 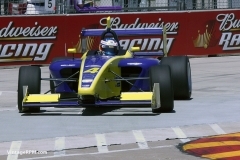 This was the last year of the Champ Car World Series using the venerable Lola B02-00 chassis powered by Ford-Cosworth engines. 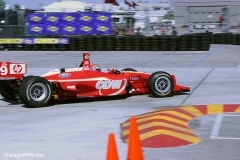 Also on the bill were the Champ Car Atlantic Series as well as IMSA’s ALMS & Star Mazda series. 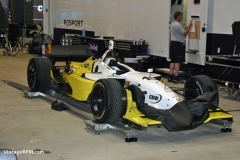 (See separate gallery for ALMS & Star Mazda photos). 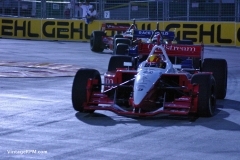 The Atlantic teams had all new cars consisting of Mazda-powered Swift 016.a chassis. This was an odd event weekend as it ran Thursday-Saturday (May 11-13) instead of the usual Friday-Sunday. This was because the headlining Champ Car race would be held under the lights on Saturday evening. 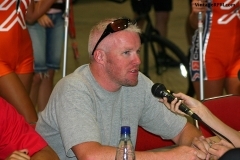 The teams rolled into town on Wednesday and began setting up. This meant that any one who wanted could roam around the track and paddock on Wednesday. Speaking of the paddock, it was not equal for all series. The Champ Car teams were housed inside the air-conditioned Reliant Arena (which also served as race control and press center) while everyone else was outside. This indoor facility , though, was quite stark and did not seem as inviting as the GRB Center downtown had. 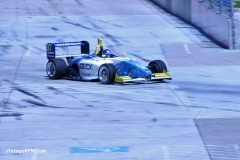 Andreas Wirth would win the Atlantic race and Sebastien Bourdais the Champ Car race. The pictures that follow were originally shot for the now defunct RacingPress.com. Because of a credential snafu on the organizers part, I did not have a photo pass for Saturday, therefore there are no pictures of the actual races.